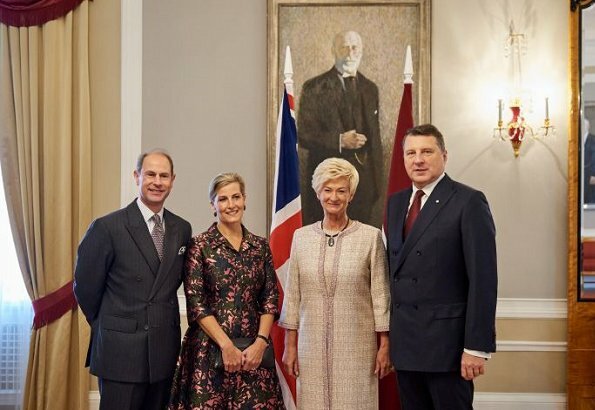 Prince Edward, Earl of Wessex and the Countess of Wessex are visiting Estonia, Latvia and Lithuania to celebrate 100th anniversary of independence of Baltic countries and 100th anniversary of cooperation of UK and Baltic countries. 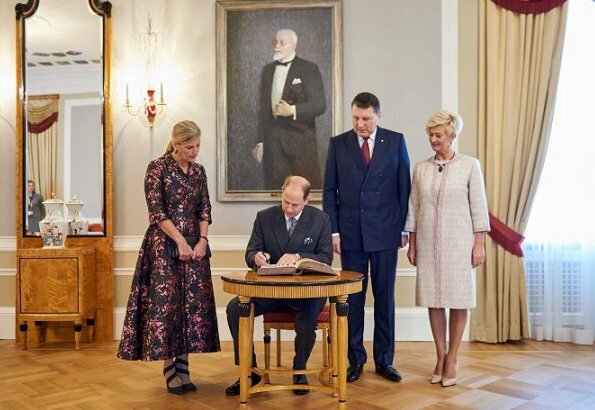 After Estonia visit, the Earl and Countess arrived in Riga, the capital of Latvia yesterday and were welcomed by President of Latvia Mr Raimonds Vējonis and Mrs Iveta Vējone at Riga Castle. 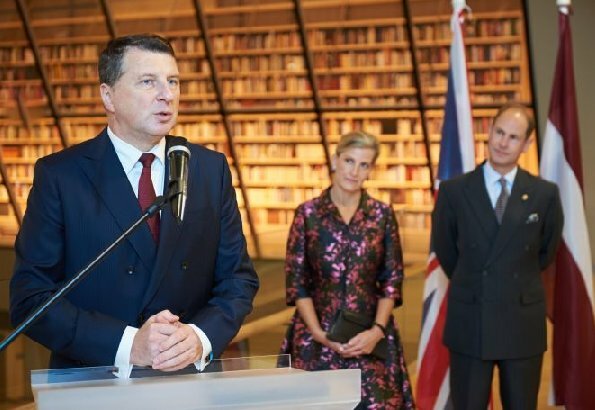 The Earl and Countess then visited Latvia National Library. 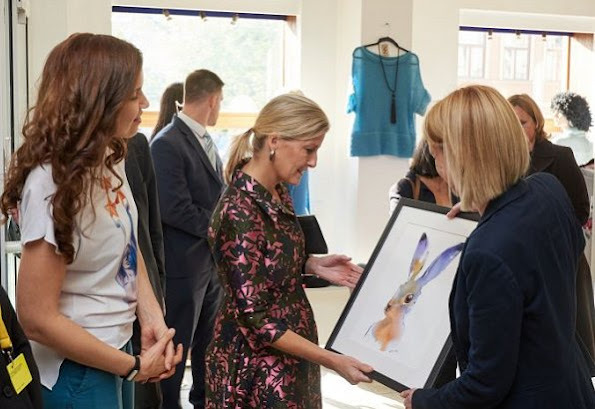 The Countess also visited OWA Fashion and BlindArt. 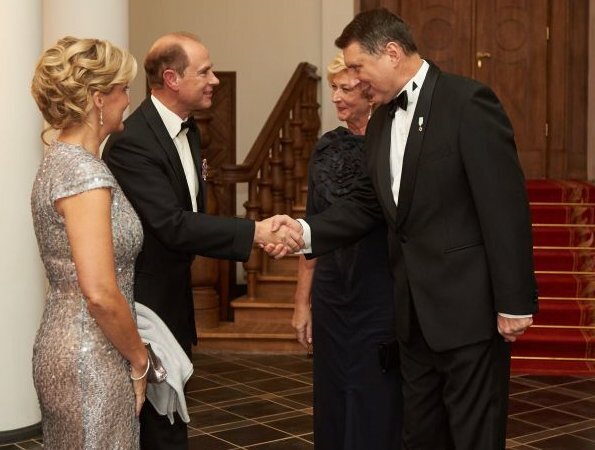 In the evening, the Earl and Countess of Wessex attended a dinner at Riga Castle, hosted by President of Latvia. Wonderful, Sophie! I like both styles a lot! Sophie is looking very nice in this Erdem dress, much better than a model, I would prefer her hair more styled or shorter. Evening dress and hair are superb. 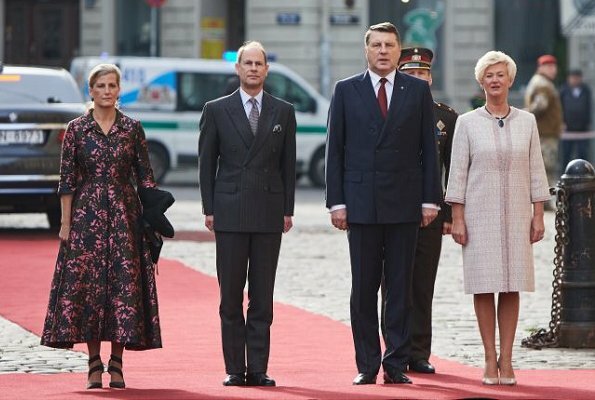 Latvia's president wife is also very chic on both occasions. Great shoes for the day appearance and beautiful hair from the back on the evening dinner. Sophie looks amazing in both events.They are really a nice couple. Her evening style is very nice, beautiful hair. The other dress does not suit her figure. I don't like the floral dress at all, too heavy, too much material, dark and not flattering, love he shoes though. The evening dress should be worn with the correct underwear, otherwise it clings to all the wrong places. 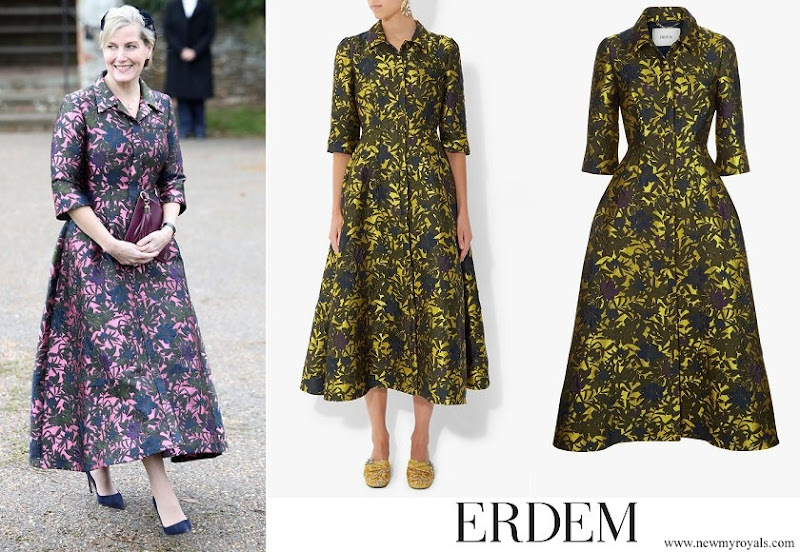 I really don't like the Erdem dress, it looks like she's dressed in old curtains. 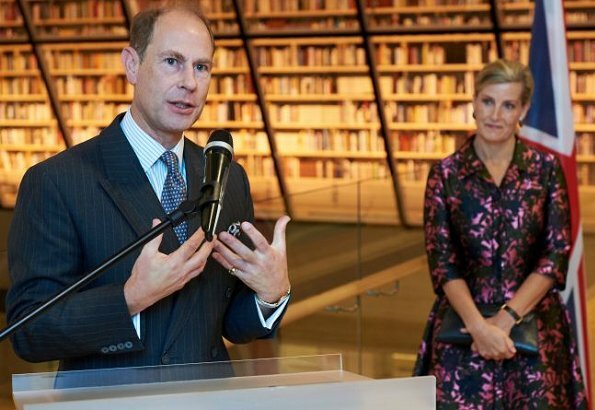 I don't quite understand the royal women's love affair with Erdem. I completely agree with you. Werden dress is not her friend. 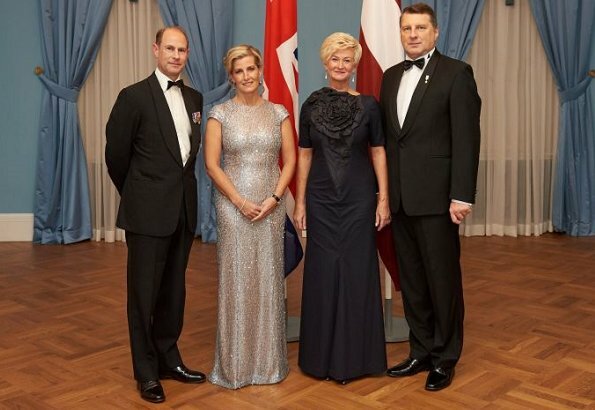 To carry off the tight evening dress you have to be tall and skinny, which she is not. Princess Diana would have looked fantastic in it. Ik hou helemaal niet van die Erdem Jurk, de rok is veel te breed , Sophie is er 10 kg dikker mee . De zilveren jurk is prachtig , vooral door het knappe figuur van Sophie en haar kapsel is ook chique. Evening look - fabulous. Day look - nope. Very nice Evening dress . Don'y care so much for the day dress,just because it is Erdem does not make it super. As far as Sophie's day look goes...Sophie, Sophie, Sophie. Please rethink the length of your skirts. They are so aging. You are hiding your amazing shoes with that skirt. The evening look is perfect. I especially like her hair. I think she has trouble with her hair, and it is nice to see it styled so beautifully. Well, well Sophie, you listemed to some of us here!!! Lol I have not seen her in such intricate evening hair style in years.....if ever. It suits her very well, it is elegant for the occasion....and frankly it would have looked good on Meg on her wedding day. The Erdem dress seems a bit heavy on Sophie, but it's a beautiful dress. The evening dress is beautiful but not her style really. I like her hair though. Her hairstyle in the evening! Wow!